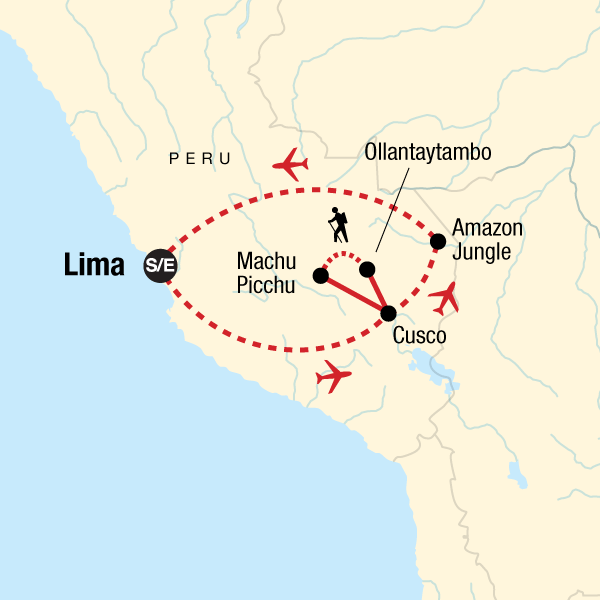 This adventure offers up an intriguing combination of beauty and contrasts in scenery, wildlife, and cultures, whether you’re scanning the canopy for wildlife from the comfort of our intimate and exclusive G Lodge Amazon or climbing the ancient trail of the Incas to Machu Picchu, situated in the heavens of the Americas. Because we run our own treks, we can ensure the fair treatment of our porters and the quality of food and equipment which leaves you free to enjoy the beauty of the region. Low Impact Transportation: A trip like this experience gives you the chance to try out buses locally managed and operated by locals like the ones picking up people from airport and running sacred valley .Getting around as the locals do not only allows you to experience the culture on a deeper level, but the same way it is at home, using local transport is the most sustainable way to go – after walking of course! Supporting local culture and businesses: There are a multitude of opportunities to support local businesses and immerse yourself in Peruvian culture on this trip. From the colourful local markets to the bustling food stalls and cafes, the choices for eating and handicrafts are endless and the money is staying in the local economy - a vital way for tourism to make a positive impact. Activities that take you to markets, locally-owned restaurants, locals’ homes and villages are vital to the local peoples’ ability to truly benefit from tourism in Peru. Our style of trip, travelling, eating and staying with the locals, puts you right at the heart of Peruvian culture. Peru’s multi-ethnicity is evident in the mixing process since the arrival of Europeans to the country. In Lima you can appreciate the mixing cultural process on the facades of churches like La Merced and San Francisco church and its Catacombs, The Archbishop house and the presence of many well decorated balconies of colonial houses surrounding the central area of Lima, Cusco the centre of the attractions around MachuPichu, the anniversary of Cusco Inca foundation or any catholic festival which happens around weekends. The Amazon ecosystem provides you wide chances to spot wildlife from a safe manner both sides (visitors a local wildlife) and learn about the abundance and diversity of medicinal plants used locally by shamans and the ones use for traditional modern medicine. It may not be apparent that learning about and respecting other cultures is part of being a responsible traveller, but we believe that this discovery is a natural way for people of all backgrounds, nationalities, and religions to interact and learn from each other, fostering peace and understanding. An amazing experience! Support World Heritage: On this trip there are numerous opportunities to visit important heritage sites on foot or by taking a local bus such as the famous Plaza Mayor in Lima, The Centre area of Cusco with its Inca streets and temples that still amazes people like Koricancha, The Cusco Cathedral and the Archaeological site of Sacsayhuaman near the city, the well known Machu Pichu and the quality of its construction, among others. Celebrating world heritage is an important way to participate in sustainable tourism. Many world heritage sites are designated for protection so that the entire world’s people can share in these fascinating and historical wonders for generations to come. Other optional unique experiences on this trip that allow you to support the local economy and learn about Peruvian culture include: Hike the unique inka trail in 4D/3N to arrive into Machu Pichu, Horseback riding trough non touristic places around Cusco city, Cooking class in Cusco learning local recipes and how to make a real good pisco sour. Truly an authentic experience! William and Abel provided food so delicious that we ate like kings in the mountains, and the Group 3 porters were all lovely and made the trip such a success. Thanks go to them - they were the best part of the holiday. Joel deserves every success and should definitely be voted back in the top 5 guides in Peru. Get stuck in! You'll only get out what you put in. Make friends and get your hands dirty. Yes - although I think that there could be more done to help local people (perhaps schools in the different farming areas near Puerto Maldonado could be set up with some of the profits), I generally felt that the holiday was beneficial to local people and was sustainably organised. One of the best things I've ever done in my life. I would recommend it to anyone who is thinking about doing it. Look into altitude sickness meds before leaving home. It was a good holiday the guides were excellent. The only thing that let it down was the quality of some of the hotels.